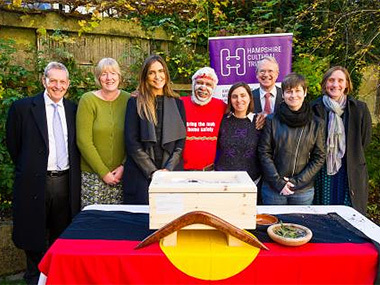 On 9th November, the new Arts Minister, Sen. Mitch Fyfield welcomed the return of Aboriginal ancestral remains from the United Kingdom to the Dunghutti community of New South Wales. On 2 November, the ancestor, who was removed originally from Delicate Nobby, seven miles south of Crescent Head near Kempsey, was officially accepted by Mr Kenneth Dickson, an Elder of the Dunghutti community in a ceremony at the Great Hall and Queen Eleanor’s Garden in Hampshire. The remains will be transferred to the Australian Museum at the request of the community, where they will be cared for in trust until the community is able to rebury them in Country. It is believed the remains were removed from Australia late in the 1960s and taken to the United Kingdom. An Australian coroner’s report of 1962, showed that the remains had been found by workmen earlier in the year and were up to 2,000 years old. In the UK, they were donated to Hampshire County Council Museums Service by a research biologist and local resident; the museum later became the Hampshire Cultural Trust. How fascinating that as recently as the 1960s, English scientists still had a desire to take Aboriginal bones from Australia back home for study! And that, pre-Referendum and before the momentous 1969 discovery of Mungo Lady it was still legally possible to achieve this bit of grave-robbing! Mind you, the story gets even murkier in England, where the donation of remains 2000 years old in the 1980s was largely ignored after the donor disappeared (and has since died) – and, indeed, would not have been accepted by the museum, according to scientific officer Christine Taylor had it been known then that “the batch of artefacts contained Aboriginal remains”. That only came to light in 2006. Christine Taylor then spent almost a decade undertaking the process of repatriation, which included a formal biometric analysis being carried out on the remains in 2009. This confirmed that they were from an Australian Indigenous male aged between 21 and middle age. A decade to achieve something that both sides, no doubt, devoutly wished to happen. Why? Christine Taylor explained, “An initial hurdle was trying to locate someone for advice on repatriating the remains – there wasn’t much information on the internet at the time. I initially contacted the National Museum of Australia, who passed me on to the Australian High Commission in London. But tracking down the most appropriate people for the return of the Aboriginal remains turned out to be a lengthy process - though I can appreciate that there are various procedures that need to be followed”. Somehow, despite this apparent lack of clarity and interest at the diplomatic level, according to the Minister, “To date, over 1,000 Indigenous Australian ancestral remains have been returned from the United Kingdom to Traditional Custodians with the support of the Australian Government’s Indigenous Repatriation Program. Through this program, the Australian Government is committed to assisting Indigenous communities in pursuing the unconditional return of ancestral remains held in overseas collections and within Australia”. Perhaps it needs to be promoted just a little bit better. For, when the complexities have been worked through, it seems to be a very satisfying process. As Christine Taylor told me, “It was a real honour and a privilege to meet Mr. Kenneth Dickson, an Elder of the Dunghutti people. The handover ceremony was a very special event”.